The last time I posted a recipe for my East series was back in June, and that’s worthy of a forehead slap. How on earth did that happen? I’ve known since the beginning that this series would take me a while to get through, but I never planned on a six month gap between posts. On today’s menu, I’ve got a cozy bowl of egg drop soup. It is THE perfect day for it. It’s snow day No. 2 here in Raleigh. The city has shut down and the neighborhood is buzzing with a mix of awe-stricken Southerners and apathetic Northern transplants who feel personally slighted by Mother Nature. And then there’s me: giddy and smiling at the snowfall from my window in cozy slouch socks as I hem and haw over which records to listen to while I work. I personally love North Carolina wintertide! It’s just enough to complete the seasonal cycle without blanketing us with five whole months of grey skies and broken dreams; we get a lush white blanket that fills the air with an awakening crispness, and it’ll all magically melt away before I get the chance to grow tired of it. I can dig it. Or shovel it. Whatever. TL;DR: Snow, slouch socks, and soup. It’s a good day. It’s no secret that I love soup. Especially East and Southeast Asian soups (hence my need for these bum Easy Homemade Ramen Bowls that tie me over between Ramen bar visits). At first blush, bringing a simple soup to this series might seem like a copout, but no. Everyone, everywhere, from every culture, can find comfort in a remedying bowl of soup. Because my love for wonton soup runs deep, I never paid much attention to the egg drop soup listed on the various Chinese menus I’ve held in my hands throughout my life. I just recently discovered what I’ve been missing. Wispy beaten eggs are spun into a soothing broth—traditionally chicken broth, but I used vegetable to keep things pescetarian—along with black or white pepper, a bit of ginger, and crisp scallions. Once it’s boiling, all you need to do is bring it down to a simmer, create somewhat of a whirlpool, and slowly pour a thin stream of beaten eggs into the whirlpool to create silky ribbons of eggy goodness. I came up with this recipe after reading several variations online and learned that its common to add turmeric to the broth in order to give the soup its distinguishable, almost radioactive, yellow hue. Of course, this is optional. 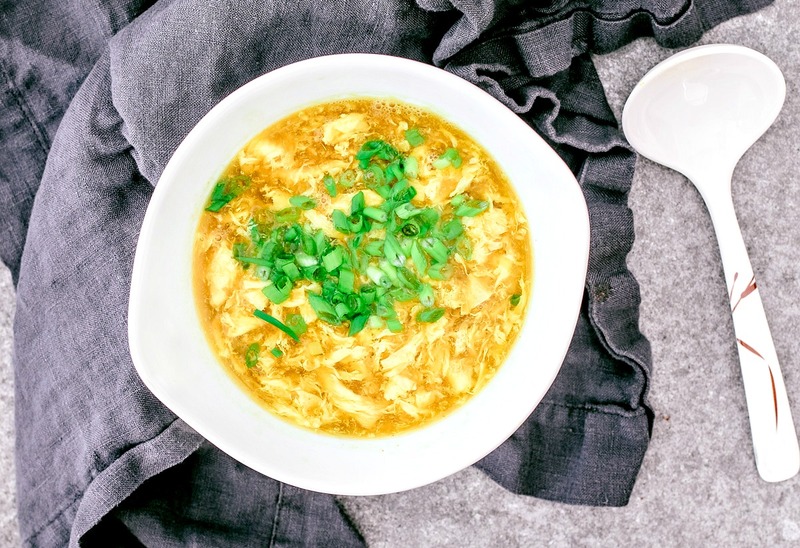 This 20-minute egg drop soup is easy to throw together and calls for ingredients you very likely already have kickin' around in your kitchen. Heat a saucepan over moderate heat. Add all but 1/4 cup of the broth to the saucepan; set the 1/4 cup of broth aside. To the saucepan, add salt, ginger, pepper, and white parts of the scallions. Bring to a rolling boil. In the meantime, mix 1 tsp of the corn starch into the reserved 1/4 cup of broth; whisk with a fork until the corn starch has dissolved. Bring the broth to a low simmer, and slowly add it to the broth, stirring to blend. In a small bowl, whisk the eggs and remaining corn starch together until corn starch has dissolved. With a ladle, create a bit of a whirlpool in the broth by stirring it in a circle. Slowly drip the egg mixture into the whirling broth; the egg should turn into thin ribbons of cooked egg. Remove the pot from the heat and let it sit for 15 seconds. Spoon the soup into bowls, garnish with the green parts of the sliced scallions, and serve immediately. *Corn starch gives the broth and eggs body, but if you prefer to not use it, you can definitely enjoy the soup without. *This soup does not refrigerate well and is best eaten fresh, so serve it immediately. Great, simple soup, made all the better by your excellent (eggcellent!) texture and look on the whispy eggs. I've always loved that feature of Chinese soups (especially in my personal favourite, hot & sour soup). Also, I'm jealous of your cozy listening setup (including feline friend). Cheers! Yessss....I've been looking for easy delicious soup recipes recently, and for some reason I completely forgot about Egg Drop Soup as an option!! I'd forgotten about it too! I used to make a bum version with Ramen packets back in the day. This is pretty much just as easy, and way tastier. Great idea to add turmeric to the soup for the yellow! I am not such a fan of the winter and can't wait for it to be over!!! I was just thinking of making an egg drop soup to have with spring rolls, and lo and behold, here it is! This looks delicious and so simple. I can't wait to try it!